The Crossfire II Series was designed to out-perform all other scopes in its price range, and Vortex nailed it. The Hog Hunter scope ranks well above average when it comes to overall quality, bright and clear optics, long eye relief, and resettable MOA turrets. The hallmark features of a good low light scope are evident in the Crossfire 2 Hog Hunter scope. It has a large 56mm objective lens with a minimum exit pupil of 4.6 mm. The V-Brite reticle is an illuminated center-dot utilizing Vortex’s V-Plex platform. With 11 brightness settings featured on the easy-to-access turret on top of the eyepiece, you’ll be able to attain positive target acquisition in extreme low-light conditions. With the addition of a 30 mm tube body, you have increased adjustment range and a robust build that’s fully waterproof and fog-proof. It’s a single-piece tube constructed from aircraft-grade aluminum to keep weight down and maximum durability at its strongest. You also have finger-adjustable turrets resettable to zero that makes for a quick and easy-to-use scope for those long shots when you need it. To help correct for parallax when those long or extremely close shots present themselves, the adjustable objective can be set at 10 yards to infinity. Buyers can’t rave enough about the high-quality and very clear glass. The V-Brite reticle not only provides an accurate and precise aiming point when the sun has made its way out, but crosshairs are identifiable and sight picture is bright. However, there are some complaints about fogging image quality when the night sky rolls in particularly due to cold weather. But, Vortex’s VIP warranty can take care of that, as it seems it may be due to a model defect. Do Bigger Objective Lens Sizes Affect Shooting? It can. Larger objective lenses require higher mounting rings to enable the bell to clear the barrel of the rifle. Higher mounting rings can interfere with comfort, ease of alignment, and a consistent stock weld. However, maximum light transmission with larger objective bells are expected when the scope is at its highest power in extreme low light conditions. It’s important to remember exit pupil also has a large role to play. For a detailed explanation on this feature, read over our “Objective Lens Diameter: Does it Matter?” article to understand the bigger picture. What size rings will you need for this Hog Hunter Scope? This will depend on the rifle and set-up you have, but a one-piece picatinny rail with 30mm rings in high height should suffice. 1 inch tubes VS 30mm tubes? There’s a misconception that larger tubes enable better light transmission versus 1 inch tubes. Sometimes this is the case, most of the time it isn’t. 30 mm tubes inherently provide more travel room for elevation and windage adjustments, and they can be built with thicker walls to improve scope durability and robustness. However, some swear by the better clarity and sharpness a larger tube provides. Why? Larger tube bodies can be made with better glass and higher quality coatings. The size of the internal lenses can be made larger than those that are in a 1 inch tube, but most of the time, they’re the same size. This in turn provides the same benefits as 1 inch tubes, but it’s the glass quality and coatings that are going to make a difference in image quality. If you’re gung-ho about larger tube bodies, it should be for the extra travel range and not necessarily for the “upgrade” in resolution and clarity. Where is the Adjustable Objective? The adjustable objective (AO) is found on the objective bell of the scope. By twisting the bell to align the distance of your target with the arrow on the scope body, your image will be focused for that distance as well as eliminate any parallax issues with the reticle. The AO is not a side focus that functions as an extra turret, although, they have the same function. For more on the differences between the two, scope by our “Mastering Parallax” article to understand the parallax phenomenon. Are Reticle Subtensions good at all Magnifications? The MOA subtensions are only usable at the highest magnification, 12x. This is a second or rear focal plane (SFP) reticle where crosshair subtensions relative to the target are constantly changing but the crosshairs remain the same over all powers. For more info on the differences between SFP and front or first focal plane (FFP) reticles, see our “Reticles Explained” article. V-Brite is the name of the illuminated center-dot reticle that seems to be exclusive to some models of the Crossfire II rifle scope series. It employs the V-Plex platform, but instead of a non-illuminated center cross, it features a dot at the center that has 11 illuminated brightness settings. Is there a Mil-dot Reticle available with the Hog Hunter? 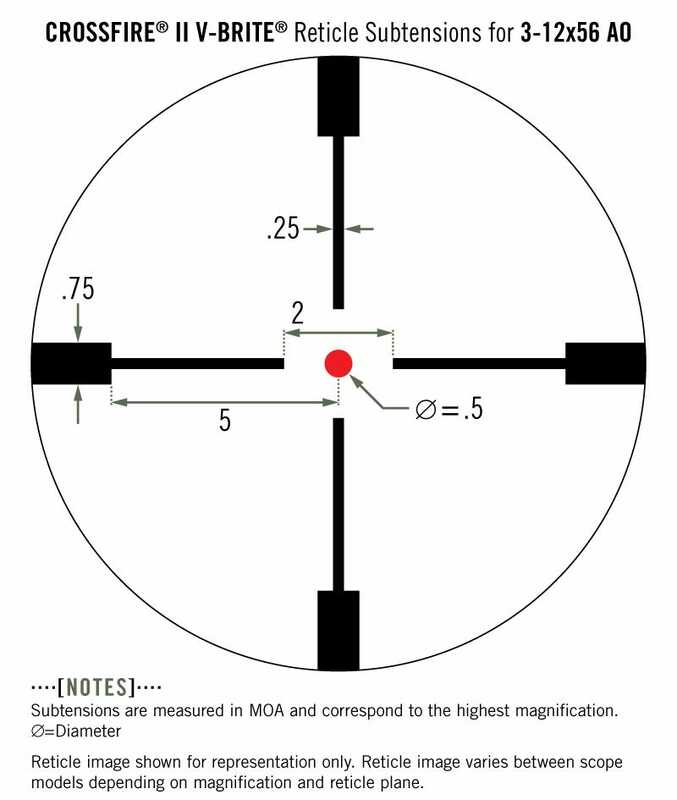 It’s unlikely that you’re going to need to make holdover adjustments during low light conditions, but if you are making those shots at high power utilizing reticle subtensions, adjustments are made in MOA increments. There are no other available reticles with this model. How Many Models are there in the Vortex Crossfire II Series? There are several models in the Crossfire II series. However, there are only four scopes in the 30 mm tube line and the rest have 1 inch tubes. The 3-12×56 is the only Hog Hunter model, while there is also the 1-4×24, 4-16×50 AO, and 6-24×50 AO. What does the Hog Hunter scope come with? Accessories included with the scope are a 4 inch sunshade, removable lens covers, and a lens cleaning cloth. Where is the Crossfire 2 Hog Hunter made? This specific model is made in China. According to the bull’s-eye, the Vortex Crossfire II 3-12×56 AO Hog Hunter scope can help you acquire extremely accurate shots in the dark. It’s ideally made for hog hunting when low light hours are rolling in. The V-Brite reticle and iconic Vortex clarity is what earns this scope high favor with feral hog hunters. For a scope that’s meant to exceed other scopes in its price range, it sure does hover above the rest! If you’re not necessarily a fan of the huge aperture, you might want to check out the Vortex Crossfire II 4-12×44 scope. It’s a lot simpler to use without the AO, and you have a little extra magnification for the moments you may need it. It’s cheaper than the Hog Hunter too, so you just might be happy with the extra savings! But, if sticking to a scope that’s specifically designed to discriminate against vermin at night sounds like your kinda thing, you might be curious about the ATN X-Sight II 5-20x night vision rifle scope . This scope knows how to nail shots in the dark. It’s a digital scope that comes loaded with features to help you navigate your way come nighttime. You’ll be able to spot hogs long before they’re onto you. 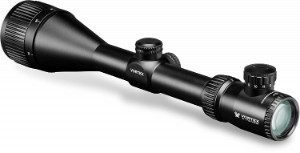 Vortex consistently provides optics for hunters who are looking for scope-specific features. If an illuminated reticle, large tube diameter, resettable turrets, and great glass are what you’re in the market for, the Crossfire II is the answer to your problems. Hogs beware! *NEW* Maven RS.1 Rifle Scope (2.5-15X44) Field Test & Review - How Does it Perform?